Maybe you've seen the article today on Yahoo today entitled "Black Friday: Best Day to Buy a Car." It talks about how experts have determined that Black Friday—that melee of consumerism after Thanksgiving Day—is the best day of the year to save money on a new car. They say that on average, buyers can save 7.5% on the price of a vehicle. So what vehicle can buyers save the most on this coming Black Friday? According to TrueCar.com, why it's none other than the Suzuki SX4. 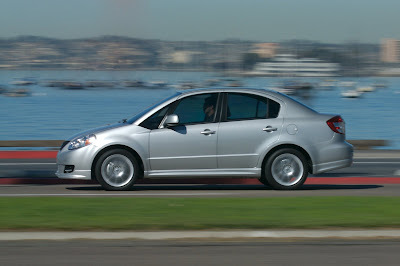 TrueCar.com predicts buyers should be able to save up to 28% off of the price of a new 2009 SX4. That means if you were to find an '09 SX4 AWD with an automatic transmission and Technology (MSRP: $17,949) you should be able to pick it up for a bargain price of $12,924. Now that's a good deal—if you can find one. However, a quick online search of our two Portland-area Suzuki dealerships yielded nine 2009 SX4s on the lots (six crossovers; three sedans). It's times like these where I wish I needed a new car. Yeah, the crossover would be a steal at that price. My neighbor bought one last year. He might be wishing he waited till this year now.